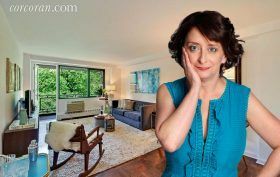 About one year ago 6sqft reported that funny woman Rachel Dratch snatched up a somewhat bland two-bedroom at 230 East 15th Street in Gramercy. While we imagined that Dratch would transform the space into quirky quarters to match her equally vibrant personality, as it turns out, Dratch has long been the owner of another similar but smaller unit in the building with a shared aesthetic. According to city records, the comedienne just shed the one-bedroom property for $925,000.